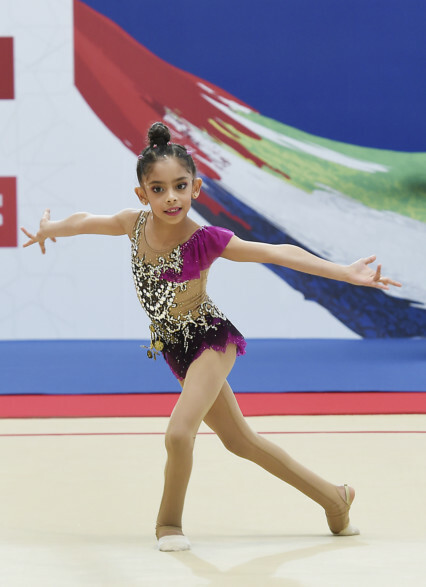 Dubai: Lamia Tariq Malallah led all winners as gymnasts from the Dubai Youth Olympic School (DYOS) dominated at the First Emarat National Rhythmic Gymnastics Championship held at the Al Habtoor Tennis Academy earlier this week. The seven-year-old, who has already won top honours at various international competitions in Europe, was easily the pick of the lot while winning gold in the Mini A category during the one-day competition. The youngest athlete to be shortlisted for the prestigious Mohammad Bin Rashid Awards this year, Lamia won the A level 2011 category with a freehand and hoop routine to take the top spot with a total of 26.000 points. Talia Marwan came in second with 12.600 in freehand and 10.100 in the hoop for a total of 22.700 points, while Karima Al Behrawy was third with a total of 22.200. Lamia’s clubmate Isabel Ahmad won the Mini ‘A’ level 2010 competition with a near-flawless total of 25.900 points, while Elvina Shabanova won the Novice ‘A’ 2008 category and Lama Islam claimed the Novice ‘A’ 2007 category. Saeed Hareb, general secretary of Dubai Sports Council (DSC) was joined by Faisal Al Hammadi, general secretary of the Emirates Weightlifting Federation (EWF) at the presentation of medals at the end of the competition. “The organisation of such a national-level championship plays a key factor in promoting the sport within the UAE. The main aim is to ensure a larger number of Emirati children take up this sport professionally as we prepare to put together a UAE national squad in the near future,” DYOS Founder Ksenia Dzhalaganiya said. More than 200 gymnasts from schools and clubs from across the UAE participated in this competition. The event was organised by Dubai Youth Olympic School in partnership with Dubai Duty Free and support of DSC and Al Habtoor Tennis Academy. Hareb also felicitated three Emirati sportswomen — Amna Haddad, Amal Murad and Alanoud Mabrouk Assadi — for their role in empowering children and women through sport.